In honor of Katharine Hepburn’s birthday this week, I’ve been thinking about some of my favorite KH moments both on and off-screen. There are certain obvious snippets people remember her for outside of her movies: her abiding love of trousers in a markedly skirt-wearing portion of the century (pants were more comfortable, damnit! 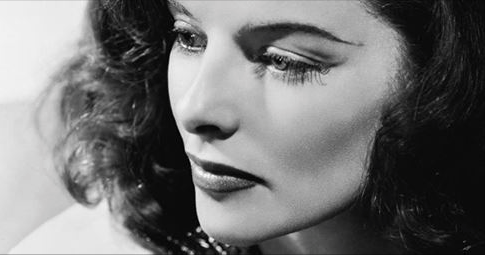 ), her less relatable and more question-mark-inducing love of Spencer Tracy (Why, Katharine? Why? ), and her drawling, haughty manner of speech. Quite honestly, there are many Golden Age actresses I prefer to watch most of the time–she is often a little too “in your face” for me–but there is just something magnificent about her that you can’t turn away from. She was an independent, feisty redhead during The Age of the Hitchcock Blonde, and even though she was unapologetically snooty about basically everything she ever said or did, you had to admire her moxie. 1. The time Barbara Walters condescendingly asked you in an interview if you even owned a skirt, and you told her you would wear one to her funeral. 2. The way you completely embodied the role of Jo March in Little Women, so much so that all other subsequent Joes would pale in comparison (except in my heart you ended up with Laurie, not stupid-face Professor Bhaer). 3. When you helped Humphrey Bogart pull the steamboat through reeds and leech-infested waters in The African Queen. 4. …The African Queen, in its entirety. So good. 6. When you, as Tracy Lord, reminisced about your marriage to Cary Grant/CK Dexter Haven via some heavy boat symbolism, and whispered to yourself “My, she was yar.” It made me want to find what the two of you had for myself: a relationship both romantic and silly, adventurous and based in friendship, with the knowledge that you were partners in life and in laughter. And, you know, someone with whom to bandy about nautical terminology that was laden with deeper meanings. 7. When you said “We are taught you must blame your father, your sisters, your brothers, the school, the teachers – but never blame yourself. It’s never your fault. But it’s always your fault, because if you wanted to change you’re the one who has got to change.” I love that. I believe the world would be a better place if more people shared your view on this particular point. 8. When your wit and joie de vivre won Cary Grant’s heart again in Holiday, despite your bizarre pairing of mink coat and flat beret, a la Madeline from the children’s story. I love when women of intelligence and playful charm win out over the boring do-nothings and the slinky seductresses, and this role was a perfect example of you achieving just that.